Well, Anushka Sharma and Varun Dhawan have been striving to promote the hard work of Indian artisans and embroiders for the past couple of months. Reason? Their upcoming film Sui Dhaaga is based on this concept of celebrating the talent of Indian tailors. And with patriotism being one of the primary themes of the film, the actors decided to celebrate one of the popular Indian festivals, albeit in an eco-friendly manner. 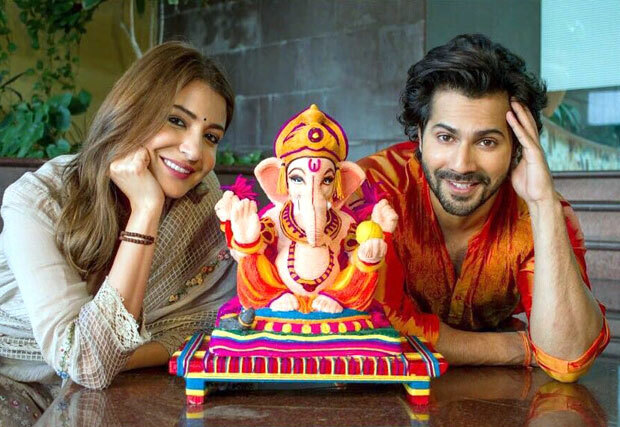 The Sui Dhaaga team, as a part of its promotions, brought forth one of the most unique ways to make an eco-friendly Ganapati. The team came up with the idea of making Lord Ganesha with clay and thread that are bio-degradable as the main ingredients of making the idol. And the idol or murthi as we call came out to be one of the most amazing pieces of work. Considering the immense pollution caused by plaster of paris Ganesha idols, many celebrities are often seen promoting the idea of going eco-friendly with the sculptures. From using mud as an alternative so that they are used to plant trees to many other alternatives are being used to create these idols. Coming to Sui Dhaaga, Varun Dhawan and Anushka Sharma will be seen in the role of Mauji and Mamta who play tailor and embroiderer. Directed by Sharat Katariya and produced by Maneesh Sharma, the film is slated to release on September 28.